My summer o’ landscaping is off to to dubious start. Aside from doing loads of weeding and mulching, my plan for the summer is to put in a side patio. 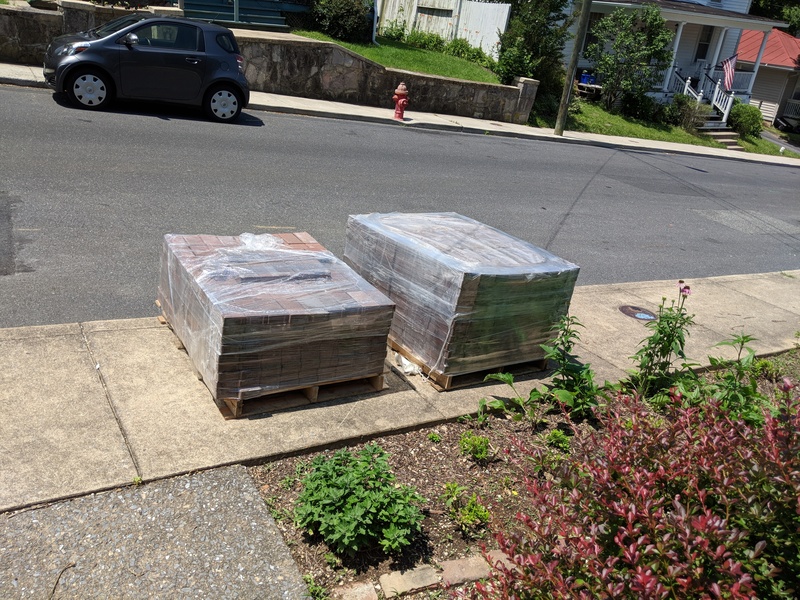 Lowe’s had a great Memorial Day sale on pavers, so I ordered everything I needed to be delivered the following week. And then came the rain. I postponed delivery for a week thinking that SURELY this past weekend would be drier than last. Not the case, as it turns out. But I just couldn’t put it off any longer. This is how it went down. 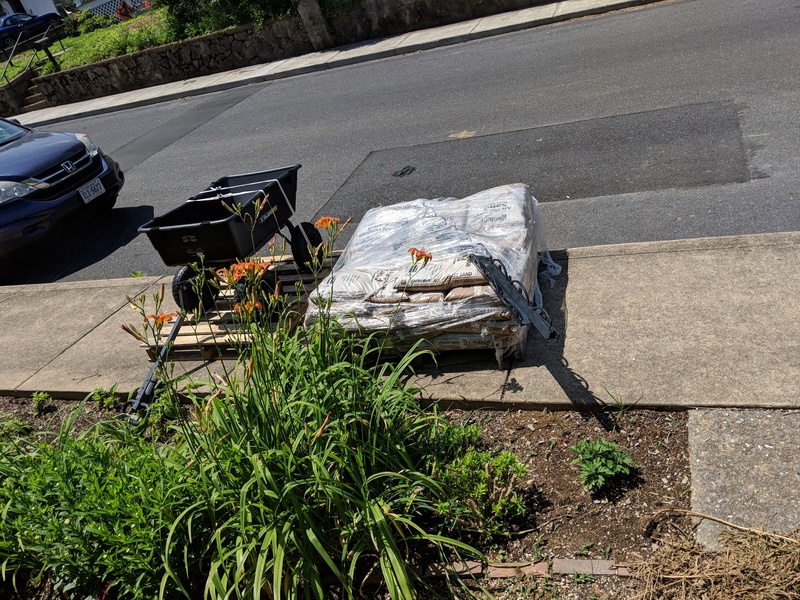 Lowe’s arrived with pavers and sand (and a cart). 1,200 pavers and 30 bags of sand, to be precise. I have no driveway which meant they had to be left on the city sidewalk. Which meant I had to shift everything down my little hill as quickly as possibly. I’ll tell you right now, this was the absolute worst part of this project. First to go was the sand. My path leading from the road down to my patio spot was too narrow and hilly to navigate my new fancy cart, but my neighbor was kind enough to let me go through her yard. As was the theme this weekend, the sand was saturated. So my 40 lb bags weighed over 50 pounds each. I felt every bit of those extra pounds and was pooped after I got them all shifted. 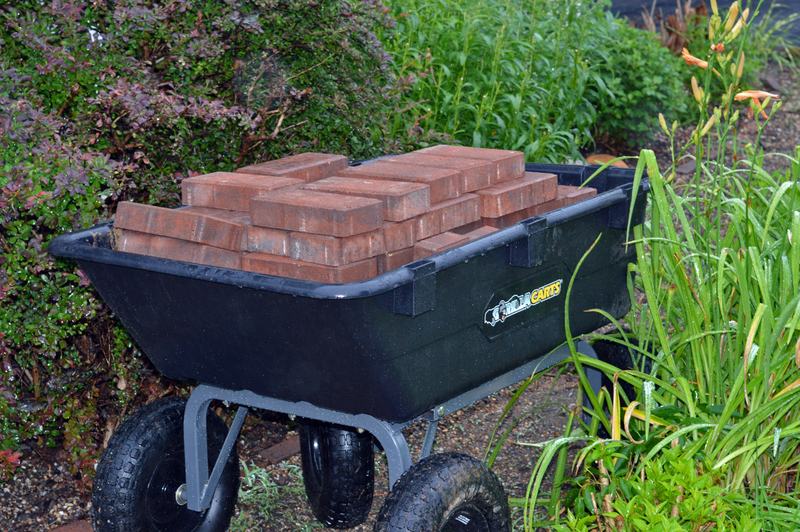 After a break, I started to move the pavers down using the cart one small load at a time – just enough to get a full course (35 pavers). I had just gotten the perpendicular courses down before it started to rain. Day two started off nicely. The forecast wasn’t as ominous, but I didn’t want to push my luck and got back to work at 6am. I started by shifting more pavers down the hill, and drinking a lot of coffee. I actually enjoyed laying the pavers. It’s a bit fiddly, but it isn’t laborious. And it’s such a reward to see it come together. In order to combat a bit of a pitch, I’ve divided the patio into two tiers. The lower section (12′ x 12′) will be a sitting area. The upper section (9′ x 12′) is where I’ll build my kiln shed. At the end of day two, I’d installed just over 1/2 of the lower (larger) tier. Then came the rain. Again. I waited out the storm on my neighbor’s porch with her family. Her granddaughter’s boyfriend took pity on my and insisted that he help me move more of the pavers down the hill. My other neighbor’s drive was blocked by this time so I couldn’t use the cart. It was all by hand at this point. Between the two of us, we were able to move over 1/2 of the second pallet when the rains started up again. DONE! End of Day 2. I woke up this morning before dawn to work on the last of the pallet. I can’t tell you how many trips I made, but I can only handle 8 bricks at a time, if that gives you an idea. 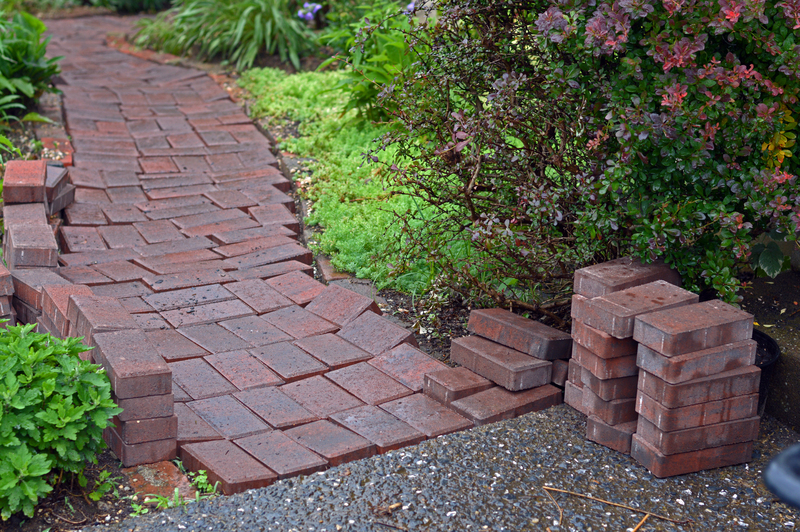 After a few trips, I was ready to do anything just to get the pavers off the city sidewalk. I filled my cart to the rim, lined the side path, and left the few remaining bits in piles around the stoop. Stacking those last pavers and clearing the sidewalk was the most rewarding moment of the weekend, I assure you. Even though I set only a fraction of pavers in place, I am relieved that the worst is behind me. It’s still raining, and there will be hit-and-miss showers around for the foreseeable future. But it’s all good. Those pavers aren’t going anywhere, and my stubby digits need a little time to heal. Girl you are amazing! It looks awesome! Congrats. Thank you! I can’t wait to get it done. Is the only useable outside area I have. And now that the old maple tree is gone, its nice and sunny there. It’s just begging for some music and a hammock!! Love your productive events! The payoffs on this one is huge!! Congrats! It looks great already. Wish I could bottle up that “Carolyn Maloney” tenaciousness. It would work better than my morning energy smoothies & suplements. And I’d keep it handy to spritz on coworkers. May head your way in July with lawn chair & “refreshments”. You’re too kind! The patio will be finished in a couple of weekends, I hope. I’d love for you to come visit. The homestead has changed quite a bit since you’ve seen it last!! HOLY CRAP!!! That is amazing my friend!!! We looked at you tube videos to try and change the filter in the fridge only to hire someone. You are FANTASTIC! HA! You’re too funny. Thank you! But may I remind you of the time I did some major kitchen remodel only to find I couldn’t figure out how to put the rack back in the oven? I had to watch a YOUTUBE on how to insert an OVEN RACK!!!!! [Let that sink in a sec]. Even I have my moments…. I actually feel pretty good! But it can creep up on you. Probably be paralyzed in the morning. 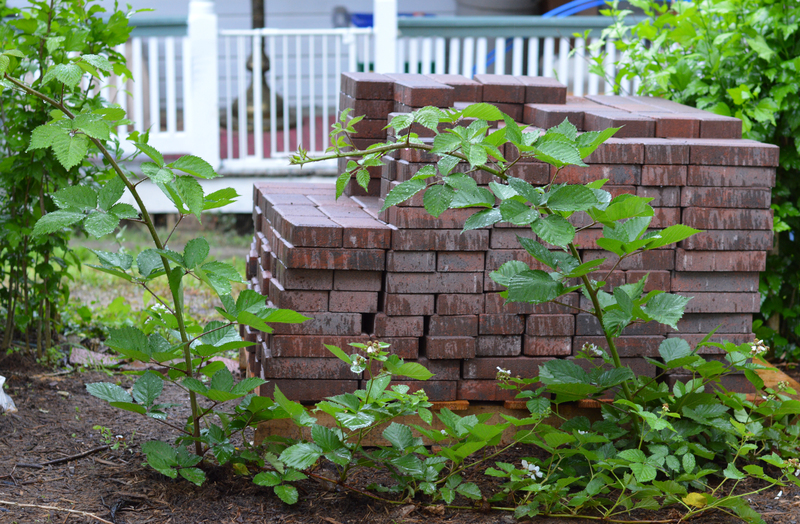 oh my lord Carolyn, it is as daunting as I had imagined — and that was just moving the pavers! You are a true inspiration girl. ok, my teeny 8×8 patio WILL be tackled this summer. Really can’t wait to see everything you have been working on when you are finished in the fall. So exciting! Yay! Glad to know I won’t be suffering alone. 🙂 It really won’t be so bad . My misery was 80% rain related (20% drudgery). As bad as it was, it did not break me! Actually laying the pavers is relatively easy (though a little time consuming). I’m excited to see it through. I hope to be done this weekend – weather pending, of course. Good luck with your project!